A hamster abandoned in its cage in a pile of rubbish has been rescued by council workers in Lancashire. The tiny rodent was discovered after council staff in Burnley received a call from a resident in Tunnel Street about flytipping near her house. The caller also mentioned spotting the hamster so the council's pest control officer was drafted in rather than risk the animal ending up in a refuse wagon. 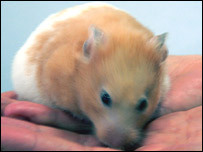 Now the hamster, nicknamed Brian after his rescuer, has been adopted by staff. Sharon Hargraves, head of customer services at Burnley Council, said that staff at the council's contact centre had fallen in love with him and had taken him on as the office mascot. "We've no idea how long Brian was dumped out in the street but it looks like he'd been chewing the bin bag because there were bits of plastic in his bedding," she said. "However, he's now enjoying the good life at the contact centre and he's quite happy to roll around the back offices in his plastic ball. "He's been a very popular addition to the team." Brian, named after the council's pest control officer Brian Ramsden, may soon have to change his name to Brioni, as staff think he may actually be a "she" and that she may be pregnant too.